Stroud council, Gloucestershire; caused by the death of Conservative councillor Penny Wride at the age of 69. Events keep happening at the moment, don’t they? Last week’s column was rendered severely out of date by the creation of the Independent Group of MPs, and this week’s may well suffer the same fate of News Happening. The 24-hour news cycle turns more quickly than your columnist’s submission deadline, and far more quickly than the local by-election cycle. Local by-elections take at least a month to organise from the vacancy occurring – so it’s obviously far too early for the Independent Group to be troubling the ballot papers yet – and your columnist is already collecting the candidate lists and putting in the research for polls in the second half of March. There are some crackers coming up, let me tell you. Today’s single by-election is to replace Stroud councillor Penny Wride, who died in December; Wride had had a varied career which ran the gamut from running a charity shop in Nairobi to setting up the Berkeley Technical College in disused buildings which were formerly part of a nuclear power complex. In her honour, the road running though the college was names Penny Lane. The Berkeley nuclear power station – of which only the reactors remain, encased in concrete until the radiation dies down enough to permit demolition – is the newest and least-lovely notable thing about the Vale of Berkeley. The vale took its name from the town of Berkeley, which is a backwater today but in mediaeval times was an important market town, as the centre of a Hundred. In the year after the Norman Conquest Berkeley was fortified, with William fitz Osbern building a castle; a Flemish nobleman called Roger de Tosny ended up running the castle and his descendants took the name “de Berkeley” after it. The castle is still in the hands of the Berkeleys today, and is the third-oldest English castle in continuous occupation after the Tower of London and Windsor. The Berkeleys became one of the most powerful families in the land, and there is still a Lord Berkeley sitting in the House of Lords today (on the Labour benches; clearly aristocracy isn’t what it used to be). Various members of the family have given their names to Berkeley Square in London and the city of Berkeley in California, which was named after the philosopher Bishop George Berkeley and has given its name to one of the most noted universities in the USA and a transuranic chemical element. Rather an appropriate association for a town whose main export was once nuclear power. But it’s not the Berkeley family which directly gave to history the most famous examples of life and death in Berkeley, Gloucestershire. The famous death was that of King Edward II, who met his end here in 1327. In true mediaeval style all sorts of legends and counter-legends have grown up about the King’s death, from his screams being heard in Gloucester to a story involving a red-hot poker, which is probably apocryphal (and even if true isn’t suitable for retelling before the watershed); all that can be said with certainty is that he died and there was probably foul play involved. The famous life was that of Edward Jenner, who investigated a story he’d heard about milkmaids not getting smallpox and ended up doing an experiment which these days would get him struck off by the medical regulator in short order. But standards were different in the eighteenth century: James Phipps, the eight-year-old boy Jenner deliberately infected with cowpox, thrived and a new medical technique was born. Because this technique involved cowpox (Variolae vaccinae, in Jenner’s words), it became known as vaccination and, despite the best efforts of latterday anti-vaxxers, is one of the cornerstones of modern medicine. Smallpox is now extinct in the wild, and for setting us on that path Jenner may have saved more lives than anybody else in history. His home in Berkeley is still standing today, and is now a museum. This ward isn’t all Berkeley. though. We’re on the east bank of the Severn estuary here, and the major centre on the shoreline is Sharpness. This was and still is a port at the end of the Gloucester and Sharpness Canal, and was once the lowest fixed crossing-point of the Severn: the Severn Railway Bridge crossed the river from Sharpness to Lydney until 1960, when it was damaged beyond repair by a barge collision and subsequently demolished. It’s not just boats that make use of the Severn: wildlife does too, and to the north of Berkeley can be found the nature reserve of Slimbridge. Opened in 1946, Slimbridge has the world’s largest collection of captive wildfowl together with many other water birds, some living there permanently, some just migrating through. The Slimbridge nature reserve, and the Wildfowl and Wetlands Trust which administers it, were founded in 1946 by Peter Scott. The only son of the ill-fated Antarctic explorer Robert Falcon Scott (who had sent him to Oundle School, providing an interesting link with last week’s polls), Peter made his name in natural history but had dabbled in politics, being the Conservative candidate for Wembley North in the 1945 general election. He lost by just 432 votes, which seems implausible when you look at the 17,061-vote Labour majority in the successor seat of Brent North two years ago; but 1945 was a different age. The current Berkeley Vale ward was created only in 2016 as a merger of two former wards called Berkeley and Vale. 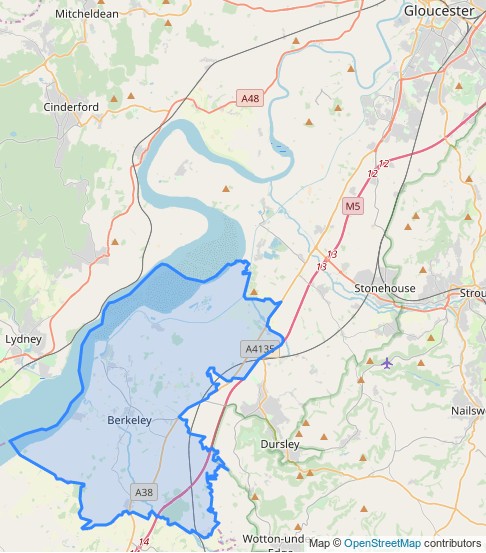 Vale ward, covering the south end of the present ward, was very safely Conservative – from 2010 its councillor was Penny Wride, and before then it was represented by Penny’s husband David – but it was only half the size of Berkeley ward, which was based on Berkeley and Sharpness and had a significant Labour vote. 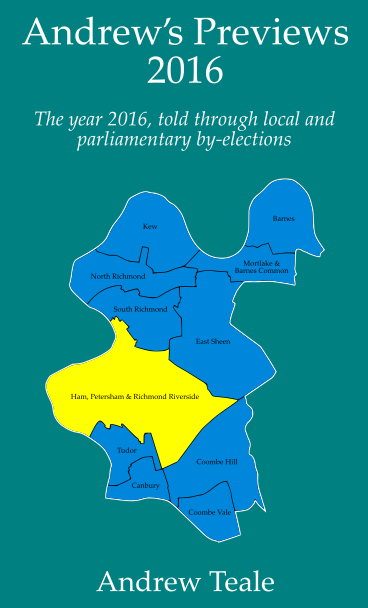 In 2012 Labour broke through and Berkeley ward elected Elizabeth Ashton, who was only 99 votes away from being re-elected for the Berkeley Vale ward in 2016. Shares of the vote in 2016 were 45% for the Conservatives, 34% for Labour and 13% for the Liberal Democrats. 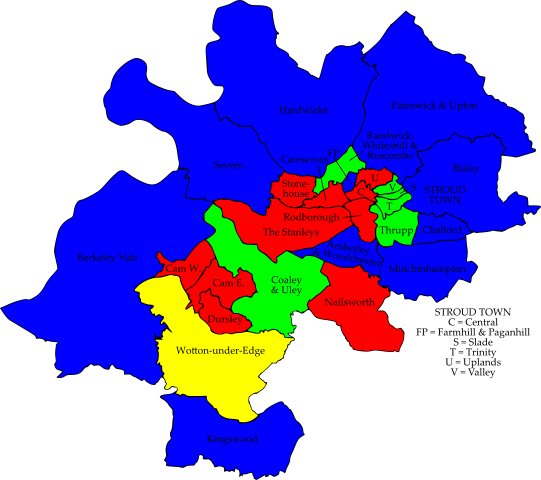 The ward is split between three divisions of Gloucestershire county council, which in 2017 elected two Conservatives and one Liberal Democrat; the Lib Dem win was in Wotton-under-Edge division, which covers the old Vale ward, but it’s clear from the district level-results that the powerbase for the Lib Dems is in Wotton-under-Edge itself. Defending for the Conservatives is Lindsey Green; a social media consultant, she lives in the village of Newport on the A38 road and is an Alkington parish councillor. Liz Ashton wants her seat back for Labour; in an age when ideological purity seems to be all the rage and the Labour party is controlled by its left wing, it’s appropriate that Ashton lives is a house called Little Moscow. (There are new rules coming in from May allowing local election candidates to redact their home address, so there may be less opportunity for jokes like this in the future.) Ashton is a Berkeley town councillor, served as Mayor of Berkeley in 2016-17 and has the backing of the local MP, Stroud’s David Drew. The Liberal Democrats have reselected Mike Stayte, a businessman (he runs a family firm selling fuels and agricultural supplies) and Slimbridge parish councillor who ran a fair way ahead of the rest of the Lib Dem slate here last time. Completing the ballot paper is Thomas Willetts of the Green Party. Some of the electors in this by-election may be pleased to note that their polling station is a pub: the Stagecoach in Newport and the Salutation in Ham are both doing their bit in the service of democracy.